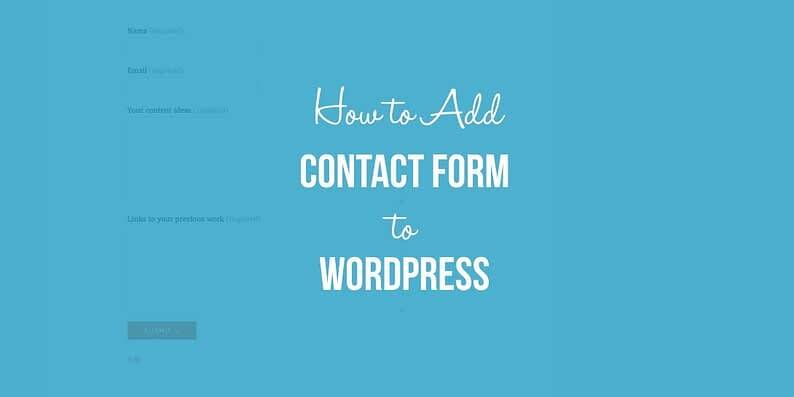 Struggling to add a contact form to WordPress? I don’t blame you. 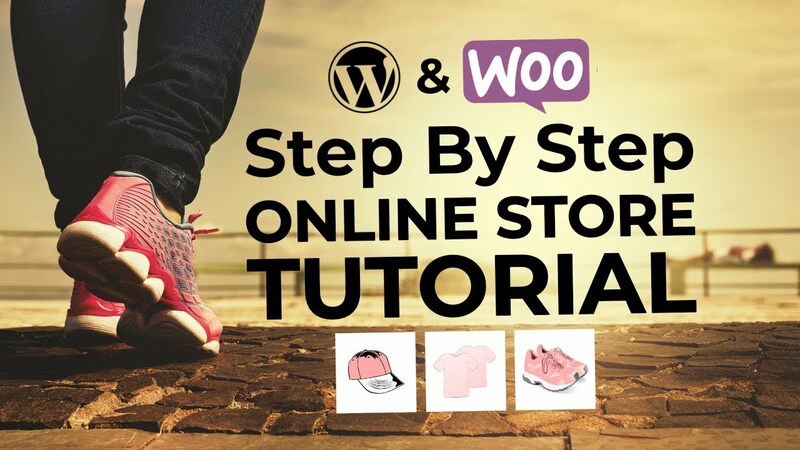 WordPress makes it easy to launch your website but, out-of-the-box, it doesn’t give you all of the tools you need to fully run your site. 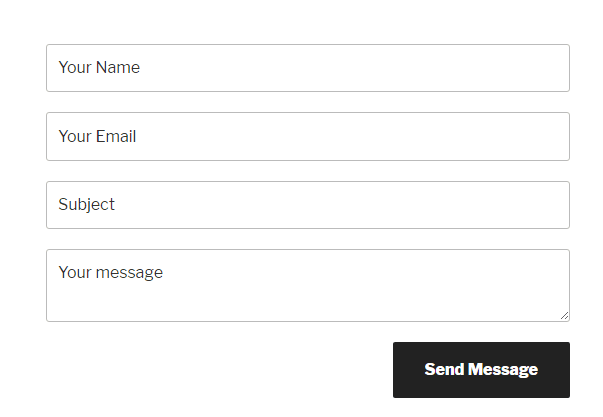 Even though pretty much every website needs a contact form, there’s no built-in WordPress contact form feature. Pirate Forms is no longer under active development. We recommend using WPForms instead because it is the most beginner-friendly WordPress contact form plugin on the market. 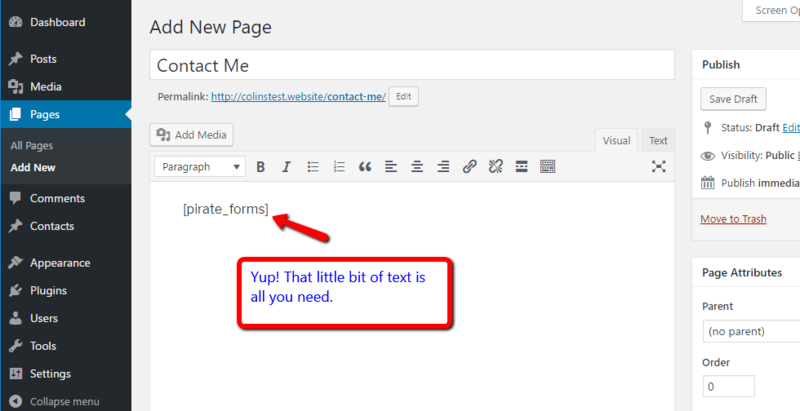 Pirate Forms is a free WordPress contact form plugin that helps you quickly create your own unique contact form and add it to WordPress. I’ll take you through all of the steps to get it set up. Then click the Install Now button. WordPress will install the plugin automatically. Then you can click the same button again to Activate the plugin. 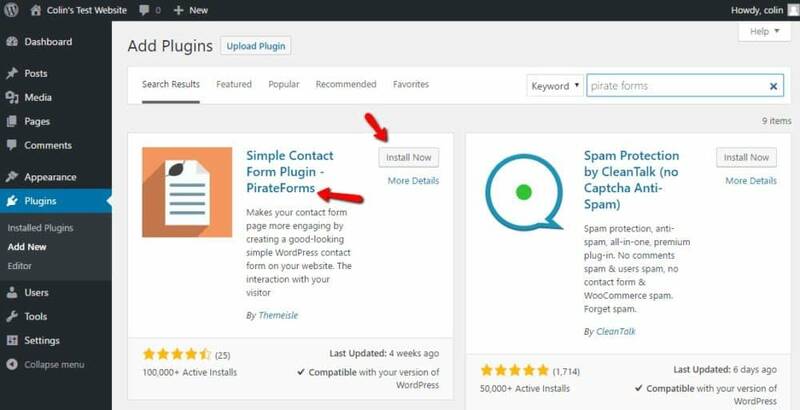 If you need more help installing Pirate Forms, we have a whole post on installing WordPress plugins. Contact notification sender email – when Pirate Forms sends you notification emails, it will come from this address. You can leave it as the default. Contact submission recipients – when someone submits your contact form, Pirate Forms will send the details to these email addresses. You should definitely add your primary email address. If you want to add multiple emails, you can separate them with commas. Store submissions in the database – when enabled, you can store form submissions inside your WordPress site (in addition to sending notification emails). When disabled, the only record of form submissions will be notification emails. Add a nonce to the contact form – put simply, this helps protect you against spam. Only disable it if you’re having problems with form errors. 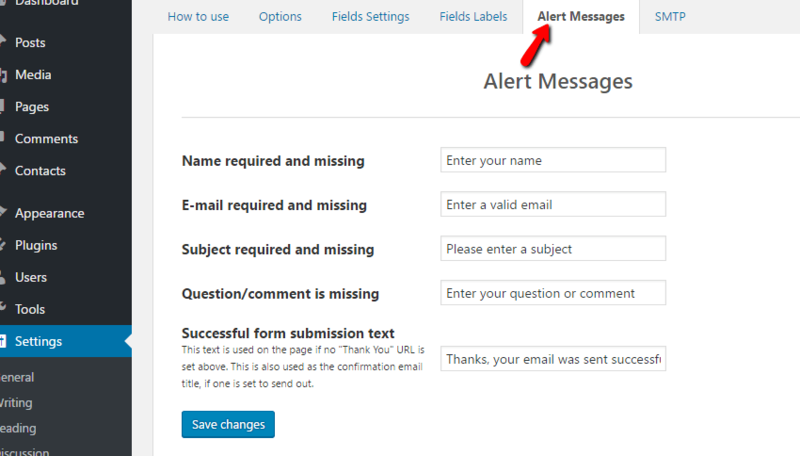 Send email confirmation to form submitter – if you want to send a confirmation email to the person who submitted your form, you can add that message here. “Thank You” URL – if you want to redirect people who submit your form to another page on your WordPress site, you can choose that page here. Otherwise, users will stay on the same page after submitting your form. The only thing you really need to configure here is your email address! Everything else can be left as the default. Required – users must complete the field to submit your form. Yes but not required – users may complete the field, but they don’t have to. None – the field will not appear. You can also add a reCAPTCHA to protect yourself from spam. ReCAPTCHA requires users to enter the text in an image before they can submit your form. I recommend you disable this option for now. If you start receiving tons of spam messages, you can always add it later. Requiring users to enter a CAPTCHA isn’t very nice, so you should try to avoid it if at all possible. You can also Add an attachment field. When enabled, users will be able to include files (for example, PDFs or Word Documents) when they submit your form. Unless you specifically need people to be able to upload files, you should leave this disabled. 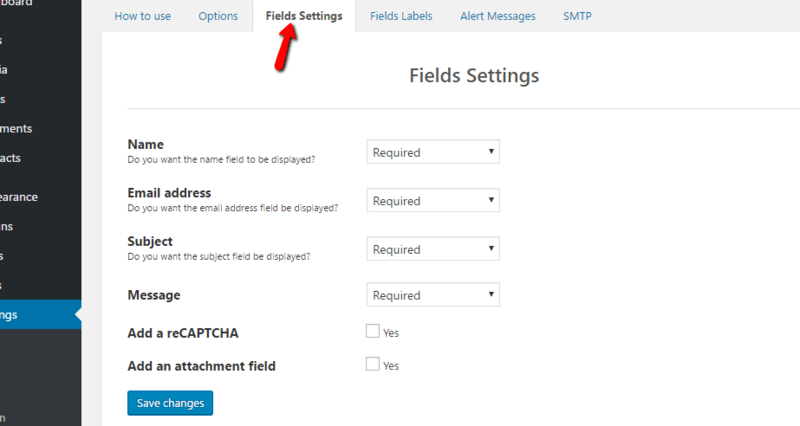 In Step 3, you chose the fields that are available on your form. 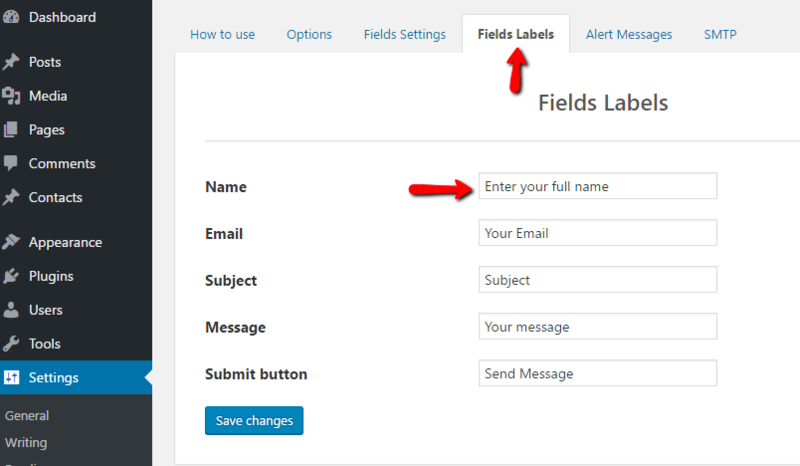 Now, you can choose the labels that appear above your form field in the Fields Labels tab. You don’t need to change any of the labels. It’s entirely your preference. Tries to submit the form with an error. Successfully submits the form (if you didn’t choose to redirect them to a thank you page earlier). If you want, you can customize the messages. But again, it’s totally fine to leave them as the defaults. Once you’ve configured your form, you’re ready to add it to WordPress! You’ll use something called a shortcode to add it to your page. 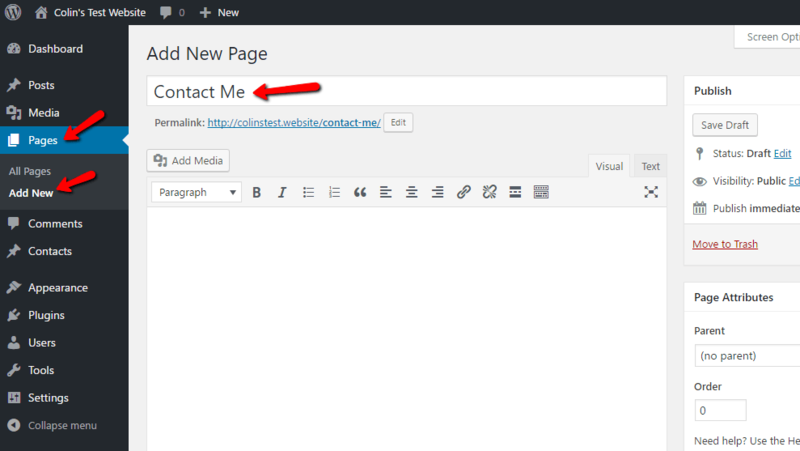 A shortcode is just a little piece of text that tells WordPress you want it to add your contact form. Pirate Forms will automatically try to match its style to your theme. So your specific contact form might look a little different. But the basic idea should be the same! And that’s it! You just learned how to add a contact form to WordPress. 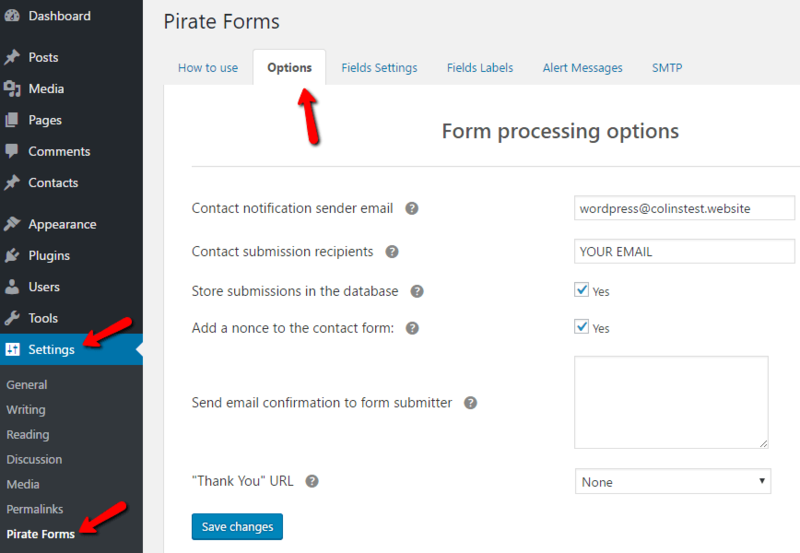 Pirate Forms is a simple way to add a contact form to WordPress. But if you need more complex forms, you might want to consider a premium plugin. You can also extend these plugins with add-ons like GravityView. And if you want even more options, we put together a big contact form plugin comparison. But again, if you just want a quick and simple way to add a contact form to WordPress, I recommend you stick with Pirate Forms.